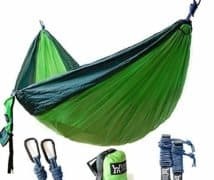 12 Best Camping Cots Reviews & Buying Guide 2019: What Not To Buy? In a restricted tent, you can’t really expect some kind of home-level comfort. You don’t have plenty of room and all types of furniture at hand. But this doesn’t mean that you need to sleep on the bare ground in your tent! 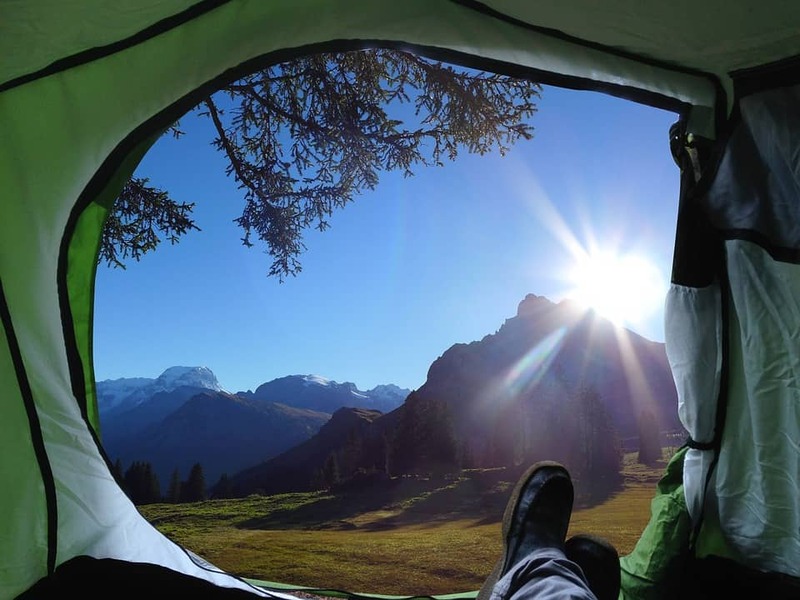 Camping cots mostly won’t be able to replace the comfort of a big bed with a memory foam mattress, but they can make sure that you get the best rest possible during your camping trips. Apart from that, they make pretty good spare beds for unexpected guests! Sounds like the right thing for you? Then welcome to our today’s reviews of best camping cots! We have got 10 models with a wide range of features and prices, so there should definitely be something for you here. They have all been praised by a large number of users, allowing us to confidently choose them for our review. Now, we are going to quickly examine the advantages and downsides of each camping cot. Then, we will provide you with a buying guide on camping cots so you don’t get confused with all those numbers and fancy names. Finally, we are going to list the benefits of camping cots and give answers to a couple of frequently asked questions. Look For The Downsides Of Camping Cots! (80 L x 44 W x 17 H)"
(85 L x 19 W x 40 H)"
(84 L x 33 W x 22 H)"
(74.8 L x 30.3 W x 6.7 H)"
(78 L x 31 W x 18 H)"
(75 L x 26 W x 16 H)"
If you are after customer reviews and you want to be with people then Teton is a great one to go for. The sole reason why we included Teton Sports Outfitter XXL Camp Cot is simple. This is a unit that everyone loves and this has hundreds of positive reviews on all platforms. Well, we didn’t say it right. Of course, there are other benefits too as well as being a well-branded unit for this one. The first benefit would be Pivot Arm Revolution feature. One of the most common issues that campers face with a cot is getting that last bar placed and when you have a pivot arm, the whole process becomes a lot easier. It goes without saying that the unit is very strong and sturdy. The S leg feature makes it very durable. Another great benefit of going with this one is the size of it. It is practically huge in terms of size. It can support up to 600 pounds (5-6 people) quite easily if you are sitting around and about 2-3 people if you are sleeping. Supports up to 300lbs of weight. The legs aren’t locked in place firmly when the cot is set up. Up next is a quite interesting model by Coleman. It is not only a convenient cot to sleep on but to spend time as well. Coleman Pack-Away cot comes with removable side table & cup holder to provide you with enough room to place your snacks, books, or personal items besides you. That’s surely much more convenient than setting your items on the floor! Coleman’s camping cot has a heavy-duty rust-resistant steel frame. The legs of this model feature plastic end to ensure you don’t accidentally rip the floor of the tent or scratch the floor at your home. Be mindful that the legs aren’t locked in place when the cot is set up, meaning that it can collapse if you try to move it around. The cover of Pack-Away is made from polyester, but Coleman doesn’t indicate the denier of the material. The cover is most probably 600D, as it is with the majority of available camping cots, so you can expect good longevity from Pack-Away. Coleman Pack-Away supports up to 300lbs of weight. Besides good weight limit, Pack-Away offers quite a bit of a sleeping area of 80 x 32 inches, allowing it to fit heights of up to 6’ 6”. 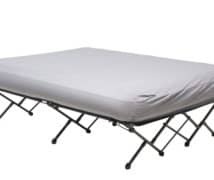 Overall, this camping cot measures 80 x 44 x 17 inches, making it both long and wide model that is convenient for those who move a lot in their sleep. On the other hand, Pack-Away weighs about 20 pounds, making it not exactly lightweight. A great thing about Pack-Away is that it comes assembled: the only thing you need to do is unfold the camping cot. Both folding and unfolding this camping cot is exceptionally easy. Coleman Pack-Away comes with a storage bag and is backed up by a 1-year warranty. Alright, let’s talk about Coleman Trailhead II. You might have heard about the Coleman Trailhead II which was another military grade unit and this one is no different. 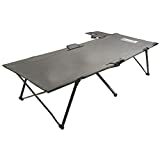 If you are looking for a cheap military grade camping cot that comes at a low price and offers all the premium features that a pricier option does, this is the one for you. The unit is not that big, however, it can take up around 300 pounds of weight which is generally 2 people. It is a great option for couples or two friends on a random camping trip. The foldable design (comes without saying) makes it very easy to store at a corner and to carry around. If you care about the measurement then that goes for 75 inches of width by 17 inches of heights. A good choice for taller individuals. Sturdy steel frame and legs. Durable and comfy 600D ripstop cover. Supports up to 300 lbs. of weight. Stands 20 inches above the ground. Up next on our reviews of best camping cots is a rather simple model by Timber Ridge. This particular camping cot is more expensive than those we examined previously, so you can expect better overall quality from Timber Ridge Camping Cot. The framework of Timber Ridge camping cot is entirely made from steel. The legs of this cot have the same sturdy design as that of Forfar Camping Cot. Besides, the ends of the legs are covered with plastic. 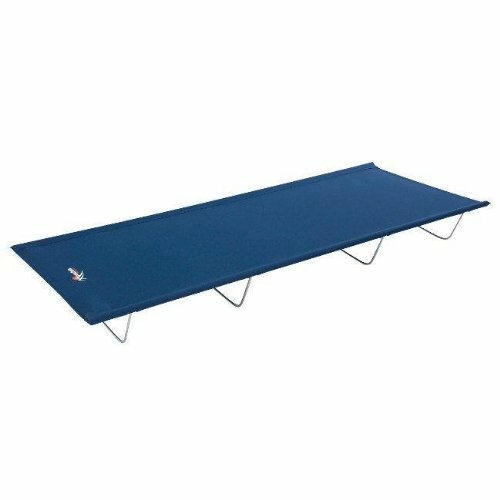 The top of Timber Ridge camping cot is made from 600D ripstop, a sturdy material designed to withstand tearing and ripping. With ripstop, small tears cannot spread easily, making the cover of Timber Ridge camping cot highly durable. However, we can’t really say whether or not the cover is water-resistant. Timber Ridge camping cot is sturdy enough to support up to 300 lbs. of weight. In addition, this camping cot offers quite a bit of sleeping room thanks to its length of 83 inches, allowing Timber Ridge camping cot to provide up to 6’11”-tall individuals with good room. In addition, the width of 31 inches should be able to provide you with enough space to move around. Another advantage (or maybe a disadvantage for you) of this camping cot is that the sleeping surface stands 20 inches above the ground. A downside of the big size of this camping cot is that it weighs 27.5 lbs., making its carry not as easy as with smaller models. Thankfully, Timber Ridge includes a storage bag to make transport a little bit easier. Timber Ridge offers a 1-year warranty for this camping cot. Very roomy: accommodates up to 6’12”-tall individuals. Supports up to 350 lbs. of weight thanks to the durable frame. 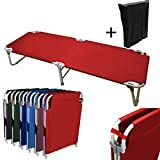 Has side storage pockets for your personal items. Easy to setup thanks to the two-fold design. The legs don’t lock out completely. Possible issues with sagging of the cover after some use. Is the size of Timber Ridge camping cot not enough for you? Take a look at Kamp-Rite Oversize Kwik Cot! Oversize Kwik Cot measures 84 x 33 x 22 (L x W x H) inches, allowing it to comfortably accommodate up to 6’ 12”-tall individuals. Oversize Kwik Cot isn’t the widest camping cot on our reviews, but 33 inches of width will certainly be enough for most of the people. At last, standing 22 inches high from the ground, Oversize Kwik Cot may make getting off the camping cot easier for those with mobility issues. Surprisingly, Oversize Kwik Cot isn’t as heavy as one might expect: it weighs only 23 lbs.! Oversize Kwik Cot features a heavy-duty, powder-coated, rust-resistant frame. The solid frame allows for support of up to 350 lbs. of weight! Kamp-Rite doesn’t say what the cover of the camping cot is made from: they only say that the fabric is600D. This should mean that it is durable, but some users complained about the cover sagging after some use. Another thing to be mindful of is that the legs of Oversize Kwik Cot do not lock out, meaning that it could collapse if you try to move it around. The ends of the legs are covered with plastic. A remarkable feature of this camping cot is that it has side storage pockets to accommodate your personal items. And as you would expect, Oversize Kwik Cot has a two-fold design for quick and easy setup. Finally, Kamp-Rite Oversize Kwik Cot comes with a storage bag and is covered by a 1-year warranty. Great if you won’t be moving from place to place a lot. Has quite a bit of sleeping room. Sturdy frame and tough cover allow for support of up to 225 lbs. of weight. No plastic or rubber cover on the legs. 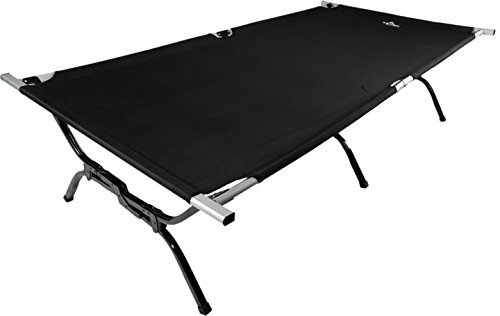 Mountain Trails Base Camp Cot is another affordable model on our list of best camping cots. But it is somewhat different from other cheap camping cots we reviewed. Firstly, it stands much lower to the ground than other camping cots we reviewed. A height of 6.7 inches may become problematic for those with joint and mobility issues, but others should find the height of Base Camp Cot comfortable enough. On the other hand, the length of 74.8 inches makes this camping cot suitable for up to 6’4”-tall individuals. The width of 30.3 inches is good as well, providing the users of the cot with quite a bit of room. Another difference is that Base Camp Cot doesn’t come preassembled like most of the cots we reviewed. you will have to assemble the frame and install the cover & the legs manually, which may take some effort. This cot isn’t two-fold, making it not so convenient for frequent trips. But if you will be putting it at home, this won’t be a problem. The frame and legs of Base Camp Cot are built from powder-coated steel while the top is made from polyester, allowing the camping cot to support up to 225 lbs. of weight. Be mindful that the C-shape legs aren’t as durable as the X-shape or straight legs. The legs also don’t have layers of plastic or rubber, making Base Camp Cot not very suitable for indoor use, though you could improvise and put some thick cloths under the leg. Great for those seeking bed-like comfort. An airtight system with Double Lock to prevent leaks. Included pump for mattress inflation. Has a lot of widths. Has a side table with cup holder. The legs don’t lock out. The mattress may sag under heavier individuals. Doesn’t come with 4 D-size batteries. Now comes maybe the most remarkable model on our reviews of best camping cots. The most noteworthy feature of Coleman Twin Airbed Folding Cot is its inflatable mattress! The mattress features the ComfortStrong coil construction, which is designed to contour your body for better support. The air mattress is inflated with the included 4D battery-operated pump. It seems that Coleman doesn’t include 4 D-size batteries with this camping cot, so you will need to get them separately. Coleman ensures leakage prevention with their AirTight system with Double Lock valves. Be mindful that heavier individuals may experience sagging with the air mattress. Coleman Twin Airbed camping cot measures 74 x 40 x 23.5 inches. While this cot may be rather short for some people, it is undeniably wide, so if you are under 6 feet tall and want a roomy camping cot, maybe Coleman Twin Airbed is perfect for you. In addition, it keeps you far above the ground with its 23.5 inches of height. 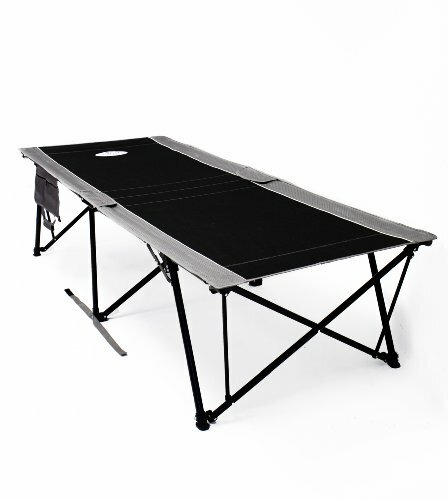 The frame of Coleman Twin Airbed is made from steel that supports up to 300 lbs. of weight. The legs are steel as well, but it seems that they do not have any lockout mechanism. Another nice feature of this camping cot is that it has a side table with a cup holder. Coleman Twin Airbed camping cot comes with an included carry bag and is backed by a 1-year warranty. Sturdy steel frame and welded steel legs. Support of up to 330 lbs. Great for up to 6’6”-tall individuals. Comes with a carry bag with shoulder straps. Easy Cot by Byer Maine is a rather balanced camping cot, having features suitable for most of its buyers. The frame of Easy Cot is made from steel, while the plastic-end legs are built from welded steel for great structural integrity. Too bad that the legs don’t lock out. The cover is made from 600D five-panel reinforced polyester. Guess what all this does to the strength of the cot? It supports up to 330 lbs. of weight! In regards to the size, Easy Cot is neither huge nor small. It measures 78 x 31 x 18 inches, meaning that it will be good for up to 6’6”-tall individuals. As you can see, Easy Cot features moderate width, which should be enough for the most of the people. But if you move around in sleep a lot, maybe Easy Cot is not the best choice. Easy Cot stands lower than some of the models we reviewed, but it shouldn’t complicate getting off of it. Easy Cot weighs around just 20 lbs., butByer of Maine includes a carry bag with shoulder straps for more convenient carry of the camping cot. In addition, the two-fold design of Easy Cot allows for quick folding and unfolding. Overall, Easy Cot will be a good choice for heavier, up to 6’6”-tall individuals who just need sturdy and comfy sleeping surface for their camping. Some issues with cover’s durability. Maybe a little bit narrow for you. 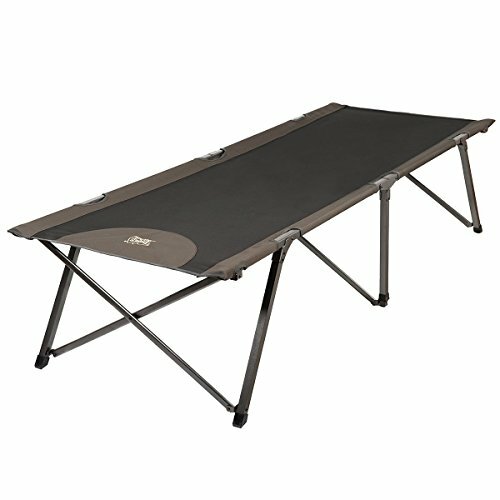 The next model we are going to be examined in our reviews of best camping cots is Deluxe Folding Camp Cot by Texsport. 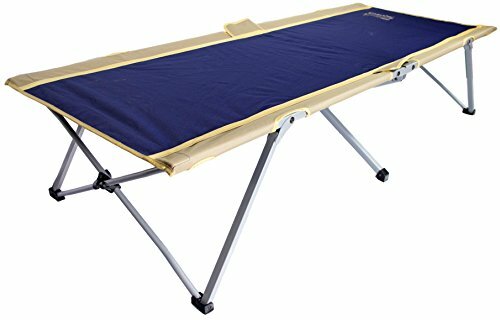 It is a rather affordable and simple yet convenient camping cot. Deluxe Folding camp cot is based on a sturdy rust-resistant aluminum frame with steel legs. The legs feature plastic ends for you to safely place it in your home or camping tent without damaging the flooring. The cover of Deluxe Folding Camp Cot is also water-resistant and is made from 600D polyester. Such covers are basically the toughest you can find out there. 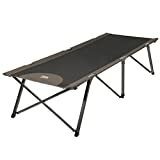 However, with this particular camping cot, there have been complaints about the durability of the cover which in some cases wears off after months or about 1-2 years of use. We can’t really say what’s the reason behind such an issue, but the number of reviews mentioning the low-than-expected durability of the cover surely grabbed our attention. The sturdy frame and the polyester cover allow this camping cot to support up to 250 lbs. of weight. The cot itself weighs 15 pounds. As for the dimensions, Deluxe Folding Camp Cot measures 75 x 26 x 16 inches, making it roughly suitable for individuals up to 6 feet tall. While folding and unfolding this camping cot is very easy, the initial set up process may take some effort. The process of setting up the cover on the frame isn’t the most pleasant one. Be mindful that the cutouts in the corners of the fabric may pose some inconvenience for you if you need as much sleeping room as possible. Deluxe Folding Camp Cot comes with a carry storage bag and is covered by a 1-year warranty. Greatly suitable for kids and teens. Steel frame & legs and oxford fabric allow for support of up to 300 lbs. The C-shape legs are not very durable. Yet another affordable model on our reviews of best camping cots. We think that this camping cot is more suitable for children and teens than adults, and let’s see why. The frame and legs of this camping cot are built from steel while the cover is made from oxford cloth, which allows for support of up to 300 lbs. of weight. However, a couple of week points like the plastic parts and the not so durable C-shape of the legs may make this camping cot, not a long-term purchase. On the other hand, if the cot doesn’t get loaded too much, it should work fine for a long time. That’s why we think it’s great for kids. The dimensions of this camping cot (72 x 24.5 x 13.5 inches) make it suitable for up to 6’-tall individuals. As you also can see, it is rather narrow and stands lower to the ground. Kids and teens won’t have problems with using this cot while adults may experience some inconveniences while, for example, trying to switch sides on the cot. Magshion Portable Military Fold Up Camping Bed Cot is rather lightweight: it weighs only 8 lbs. Add to that the folding design and the included storage bag, and you get easy to set up and carry camping cot! Comes completely assembled: just unfold and use the camping cot! Is shorter and narrower than some other camping cots we examined. Not suitable for those taller than 6 feet. The oxford cover isn’t water-resistant. Forfar camping cot features a high-class aluminum alloy frame that is sturdy as well as rust-resistant. Its PVC-coated oxford cloth ensures supreme comfort during rest, though it seems that the cover isn’t water-resistant. The legs of Forfar Camping Cot are something between regular straight and X-shaped legs. Such a design ensures good stability and durability of the camping cot. In addition, the ends of the legs are covered with plastic to make sure that you don’t damage the surface you put the cot on. All of the above allow Forfar Camping Cot to support a maximum of 260lbs, making it suitable for most individuals from the standpoint of weight. As for height limit, Forfar Camping Cot probably won’t be very suitable for tall people. With 71 inches of length, slightly less than 6 feet is the height limit of this model. Width isn’t a strong suit of Forfar Camping Cot as well. This 25.6-inch wide camping cot is one of the narrower models, so it definitely isn’t for those who move around in their sleep a lot. 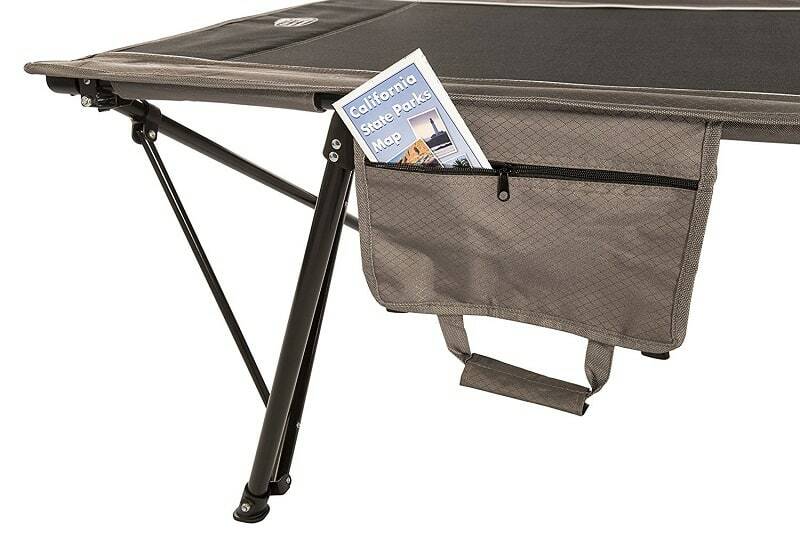 Weighing about 17 lbs., this camping cot is quite lightweight. Forfar Camping Cot comes completely assembled, you only need to unfold the camping cot to start using it. The two-fold design makes setup and storage of this camping cot exceptionally easy. At last, Forfar’s camping cot includes a carry bag for convenient storage and transport. All in all, Forfar Camping Cot will be ideal for shorter individuals who don’t really need a cot with a water-resistant cover. Quality 600D water-resistant polyester cover. Comfy for up to 6’6”-tall individuals. Closing off our reviews of best camping cots with another affordable cot by VIVO. At the base of this camping cot is a sturdy steel frame. The cover of the camping cot is made from 600D water-resistant polyester. On paper, all this allows for support of up to 250 lbs. of weight, but it seems that the legs of this cot aren’t as sturdy as one might have wanted, as the complaints of the cot’s users have demonstrated. On the other hand, there a lot of buyers who absolutely loved the cot! 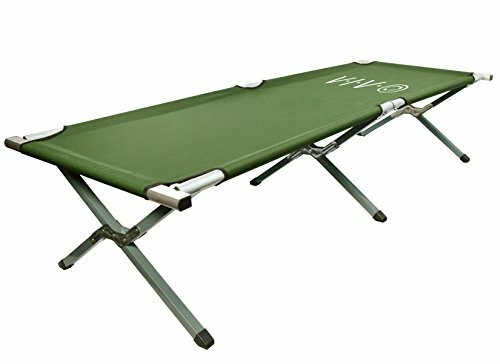 VIVO military style camping cot measures 75 x 25 x 16 inches. It supports a good range of heights up to 6’6” but probably won’t be too comfortable for those who move around a lot during rest. Weighing 12 pounds, this cot is rather lightweight, maybe due to the relatively weak legs that could have had more strength to them. This camping cot doesn’t come assembled, so it will take some effort to set it up. On the other hand, it has a two-fold design, making future setup and fold up easy. We feel that VIVO camping cot is the best for those who won’t be pushing it to the limit. If the weight limit of 250 lbs. is more than enough for you, you can confidently choose this coat, otherwise, you should probably look for something else. VIVO military-style cot is a great product, but we just can’t ignore the number of users that mentioned those weak legs! Now that you have the 10 best camping cots before you, it is the time to tell you about how to choose the absolute best one among them. Because “best” may be highly subjective as the needs of each of us are different, we can’t tell you which camping cot will be ideal for you, but we can provide you with guidelines on which features of camping cots to look for. Let’s now examine what makes camping cots. The frame is the very base of a camping cot. Its design and the materials it is built from impact the final level of comfort a cot delivers the most. A sturdy frame won’t wobble when you move around in your sleep. 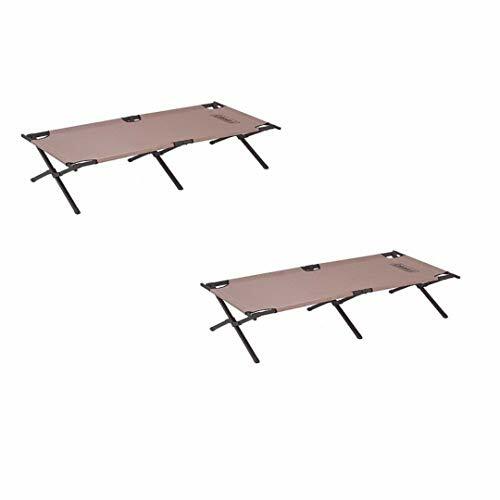 In addition, the overall durability of a camping cot is dictated by the materials camping cots are made from. Cots come with frames from a variety of materials like aluminum and powder-coated steel. The frames of camping cots are typically rust-resistant, so you will be able to safely bring them over even to the most humid locations. However, you should dig deeper to learn whether or not the frame is rust-resistant because not all the manufacturers put info on it their product descriptions. The legs are no less important than the frame. The typical leg designs used in camping cots are the military x-style, straight, and C-shaped legs installed both broadways and lengthways. The former two deliver great durability and stability while the latter is found in cheaper models. In some camping cots, the legs aren’t locked off when the cot is set up, which means that the cot may collapse when, for example, you move it around. This isn’t a rule for all models with such legs, but you should make sure that the leg design is as sturdy as you require. Another thing to consider is rubber/plastic caps at the ends of the legs. They ensure that the legs don’t tear the floor of a tent or won’t scratch floors at your house. The cover (also called top) of a camping cot is what you will be lying on. These days, covers are being made from a variety of materials like polyester or oxford fabric. The choice of the cover material will mainly depend on your preferences, though there is one other consideration as well. You probably want to make sure that the cover fabric is water-resistant. Covers made from synthetic polyester are water-resistant, which can’t be always said about oxford textile. 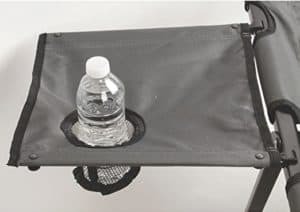 You don’t necessarily need to get a camping cot with water-resistant cover if you won’t be putting it outdoors, but having such a top might make your life easier. Most of the available camping cots feature water-resistant covers. Manufacturers denote the density of the fabric with something like “600D polyester”, D standing for denier, a unit of measure for the linear mass density of fibers. We won’t dive deep into the definition of denier and will just say that the more the denier is, the heavier and the more durable is the fabric. You should also look for camping cots with mesh bottoms. In rain, they will allow you to lie face down and easily breath through the mesh in case you are outdoors. You should absolutely consider the weight a camping cot supports at maximum. Sure, if you weigh 250 pounds, you can lie on a cot with a 200-pound limit pretty comfortably. At least, at the beginning. But keep in mind that you will thus most probably compromise the integrity of the cot which is simply not designed for excessive loads. 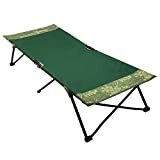 There are camping cots out there with a variety of weight limits, so you should be able to find something for yourself. The length and width of a camping cot are of high importance as well. They limit the max height of a person a cot can accommodate comfortably. Usually, manufacturers indicate the maximum supported height in their product description, but if you don’t see those numbers, you can roughly estimate yourself whether or not the camping cot will be enough for your height. Also, consider the distance between the frame and the ground. 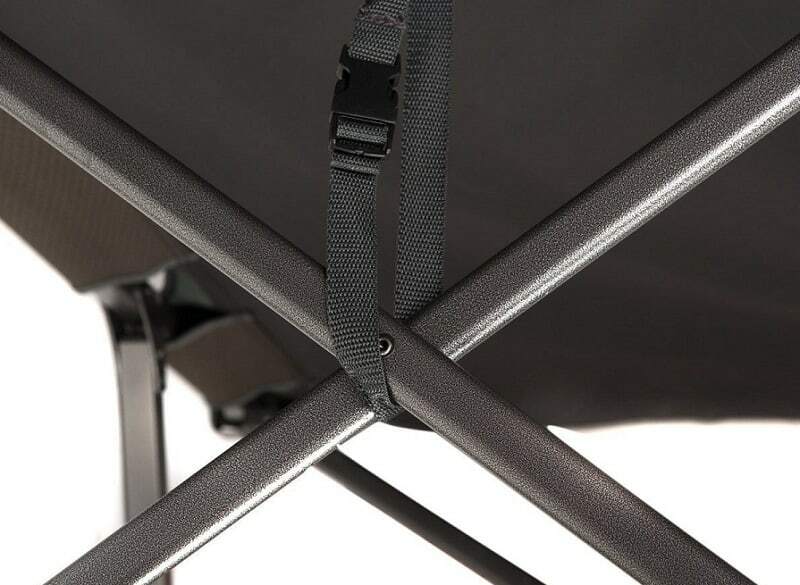 Maybe this isn’t very important for you, but for those who have joint or mobility issues, the right height may make getting off the camping cot much easier. If you have joint issues, you should estimate the height that will be convenient for you. Easiness of setup isn’t of that much importance if you will be keeping the camping cot constantly assembled at your home. 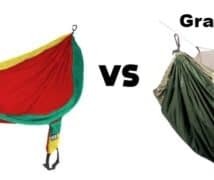 On the other hand, if you know that you will be needing to fold and unfold your camping cot a lot, you should look for a model that features folding design. Apart from the main features, you can look for a number of other things as well. 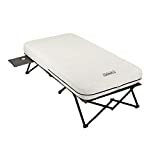 Some camping cots come with elevated or padded headends. Others come with removable side tables with cupholders. In addition, some camping cots come with included storage bags while others don’t. Such features aren’t the most important with camping cots, but they can add some convenience to their use. Apart from the features and advantages, you should search for the disadvantages of camping cots as well. The easiest way to do so is by reading user reviews. Negative user reviews can provide you with the most useful info, though some issues like poor shipping will be mostly individual. Positive reviews usually mention the upsides as well as some minor drawbacks of camping cots. But what if those minor issues are crucial to you? Before making your final choice, you should thoroughly examine all the aspects of a camping cot you like. Certainly, the product description may sound ideal, but there may be some things left out. For instance, Texsport Deluxe Camping Cot has a 600D polyester cover which should be extremely durable, but some users have complained about its durability. There could be a variety of reasons for such a disparity. The same could happen to any component of a camping cot. That’s why you should meticulously examine every single feature of camping cots. People don’t spend their money on camping cots for nothing. After all, they have advantages that are worth the money. But what are the benefits of camping cots? There are so many available camping cots out there, and anyone could find a suitable model for their requirements. The compactness of camping cots doesn’t mean that you will be deprived of a good sleeping area while camping. Move around a lot while you sleep and need space? Pick a bigger camping cot! Don’t need too much length and width? Very well, a wide range of smaller camping cots awaits! Finding the perfect camping cot won’t be an issue! You won’t be able to put your queen bed for a home level of comfort in a restricted tent. That’s when camping cots come into play. 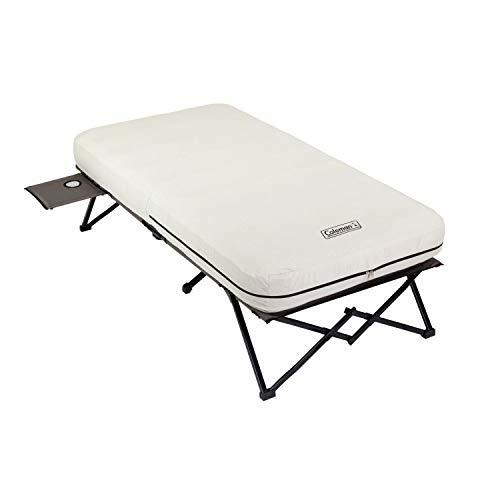 Some camping cots even feature inflatable mattresses, allowing you to enjoy supreme comfort during your camping trips. Sure, you can’t bring over your bed, but you can sleep and rest in a tent pretty comfortably with a camping cot. The high level of comfort makes camping cots ideal as spare beds. Having a second full-size bed might be unnecessary, not to mention that you may simply not have enough space for one. Having a camping cot at home will help you provide your unexpected guests with a place to sleep. Most camping cots feature foldable, compact design, allowing you to easily put them away when necessary. Plus, a model with rubber-end legs won’t scratch your floors! There are two main dangers awaiting you outside: cold and insects. Even if you put a mattress on the ground, you cannot be sure that you won’t freeze. After all, the mattress or any other kind of cover will cool down due to contact with the ground. As for insects, they may climb onto the mattress and bring along some unpleasant experience, not to mention that they could be dangerous to your health. Standing on legs, camping cots resolve both problems. The cover won’t get as cold as the ground as it is far up above, and the insects will have a hard time climbing onto the sleeping surface. So if you want to have an as high level of comfort as possible, you should definitely look for a good camping cot. Q: Can you put two camping cots together for a bigger sleeping area? Ans: You could do that, but lying on two camping cots won’t be even remotely comfortable. Yes, the sleeping area has doubled, but the frames didn’t go anywhere. The frames of the camping cots in the middle won’t allow you to rest and sleep comfortably. Q: Is putting a mattress on a camping cot a good idea? Ans: You could try to put a mattress with the same dimensions as those of the camping cot, but you shouldn’t expect great levels of comfort. The mattress will probably sag because there won’t be a solid surface beneath it. Bigger mattresses will work even worse as their ends will hang down, which could compromise the overall stability of the cot. Q: Can I use sheets with camping cots? Ans: You can, but keep in mind that regular sheets are not water-resistant. You would also have to think about the loose ends of the sheet, but you could wrap them around the bottom, for example. 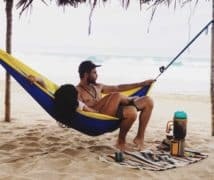 Q: I like a camping cot, but its legs don’t have rubber or plastic caps. What should I do? Ans: You can try to put some pieces of thick fabric or cardboard under each leg of the camping cot. However, you would need to pay special attention to the pieces do not move out from under the legs. Here you have it! We examined 12 best camping cots and introduced you to the pros and cons of each model. By now, you should also be able to easily distinguish between the main features of camping cots to be able to pick the right one. And if you have been skeptical about their use, we introduced to the benefits of camping cots. If one of the presented cots was the right one, you will only have to order it! Otherwise, you would have to look further. If you want to buy the perfect camping cot, remember an important point: conduct thorough research! Firstly, know your requirements. Why buy a $100 cot if you will be satisfied with a $50 model? Then, learn what features make camping cots. We have already provided you with a guide, but feel free to research more if there is something unclear left to you. Follow these guidelines, and you will surely be able to find the ideal camping cot!